UCAN, Waxy Maize, Fructose: Which Is Best? I love UCAN, but it’s expensive. Waxy maize could potentially work as well but there’s no way for me to know because the studies compare UCAN to maltodextrin. Wait, you’re still choking down maltodextrin gels and shot blocks? That’s so 2012! You may find it helpful to watch this presentation by the wonderful Peter Attia to understand why any of this is interesting for endurance athletes. During this podcast interview with Dr. Tommy Wood, we review the science on carbohydrate supplementation and discuss some of the problems with the UCAN study and in underpowered studies in general. This article is to report the first set of results I had from testing one of three carbohydrate sources: UCAN, waxy maize, and fructose. Tommy and I discuss the details of the experiment in the podcast, the only thing that’s changed since then is that I found a way to test my glucose and insulin at home using a dried blood spot test. I’ve been training and racing mountain bikes and cyclocross at the elite level and on a ketogenic diet for about two years now. My ketones are typically low in the morning, around 0.5mmol/L, and peak at around 1.2mmol/L in the early evening. For the few weeks leading up to this experiment I’ve been indulging in a weekly carb refeed as about 200g of starchy root vegetables like plantain chips and sweet potato. I was hoping this might improve my ‘cross race performance at the weekend but I can’t say I noticed anything other than being slightly hungrier. Hopefuly the protocol is clear from the table below, or you can also see the results in a Google Docs spreadsheet. Shortly after I woke up, and in a fasted state, I measured my blood glucose and insulin from a fingerstick made with a lancet. It sounds awful, but the lancets must be incredibly sharp because I didn’t feel a thing. For comparison, I also measured glucose and ketones with my handheld meters. For good measure I measured breath acetone using my Ketonix meter. 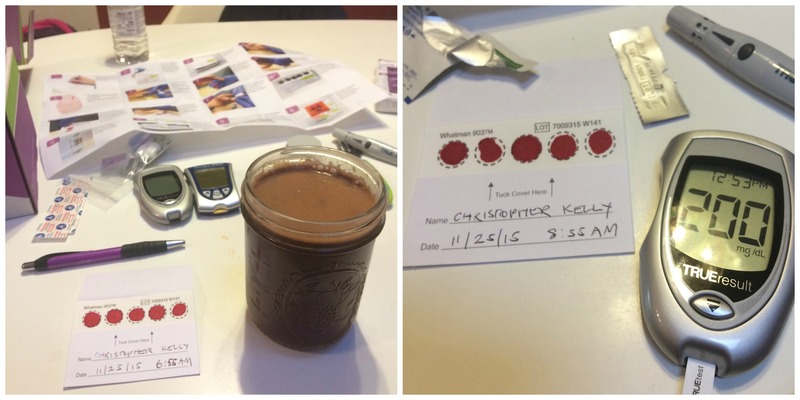 At 7:25 AM I drank 75g of a mystery carbohydrate combined with chocolate powder and stevia. The drink was designed by my food scientist wife Julia, and the reason I say mystery is because I was deliberately blinded, i.e. I don’t know what type of carbohydrate I drank. Julia choose the ingredients so that she could prepare three drinks that taste almost identical yet contain either UCAN, fructose or waxy maize. I’m also considering extended the experiment to include Vitargo, a carbohydrate marketed to endurance athletes yet described as fast-digesting with “ability to rapidly raise glucose and insulin levels”. At 7:55 AM I began a one hour bike ride with two 90-second race-pace intervals. The conditions were cold and damp and I’m sure the stress of riding contributing to my surprising glucose peak of 200mg/dL. The ride was an imperfect simulation of a race but still better than sitting on the couch. The test I used was designed to diagnose hidden diabetes and was inspired by the work of Joseph Kraft. According to Kraft, I’m an insulinopenic type 5 which may be normal for people eating a low carbohydrate diet. You can find out more about Kraft in this fascinating interview with Ivor Cummins. The result shows that I don’t need much insulin to dispose of glucose which is the way it should be. Next I'll repeat the experiment for the three remaining carbohydrates and report on my findings. Are you wondering how your body responds to different types of carbohydrate? The test I did is not that hard to do a home. Order yourself a kit and let’s find out. Did I miss a carbohydrate you’d like to see tested? Let me know in the comments below.